The Ptolemaic world-picture (in which the earth as a globe represents the centre, around which the planets revolve in a variety of orbits or spheres, surrounded by the heaven of fixed stars and, at the outside, by the Empyrean devoid of all stars) does not take away the meaning of the earlier world-picture any more than it takes away mankind’s immediate experience of it. It brings, moreover, into play a different symbolism, namely that of the all-comprehending character of space. The gradation of heavenly spheres reflects the ontological order of the world, according to which each degree of existence proceeds from a higher one, in such a way that the higher degree `contains’ the lower one, just as a cause `contains’ its effect. Thus the wider the heavenly sphere in which a star moves, the purer, the less conditioned, and the nearer to the divine origin is the degree of existence or the level of consciousness which corresponds to it. The starless Empyrean, which surrounds the starry heavens and which seerns to impart to the firmament of fixed stars (the fastest and most regularly revolving of all the spheres) its movement, represents the prime mover (primum mobile), and so also the all-embracing Divine Intellect. This was the interpretation of the Ptolemaic world-picture adopted by Dante. Before his time it was already to be found in Arab writings. 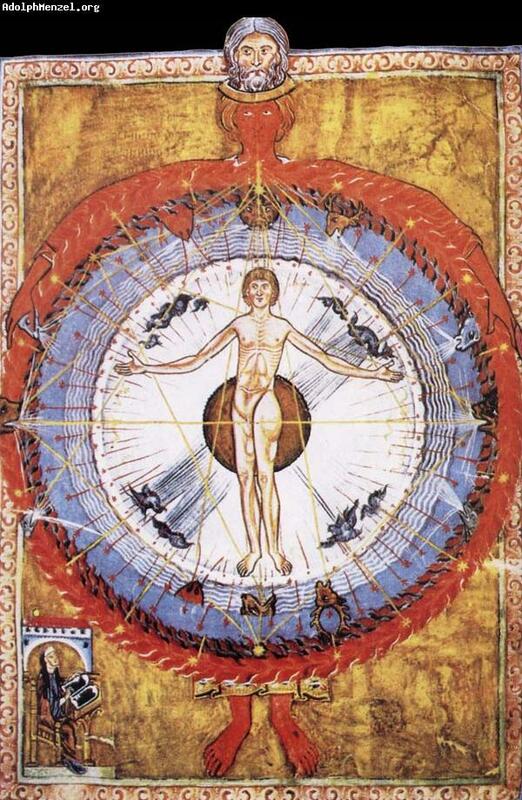 There is also an anonymous Hermetical manuscript of the twelfth century, written in Natin and probably of Catalan origin, in which the spiritual meaning of the heavenly spheres successively surrounding one another is presented in a marmer reminiscent of the Divine Comedy. The ascent through the spheres is described as an ascent through a hierarchy of spiritual (or intellectual) degrees, by means of which the soul, which successively realizes these, gradually turns from a discursive knowledge bound to forms to an undifferentiated and immediate vision in which subject and object, knower and known, are one. 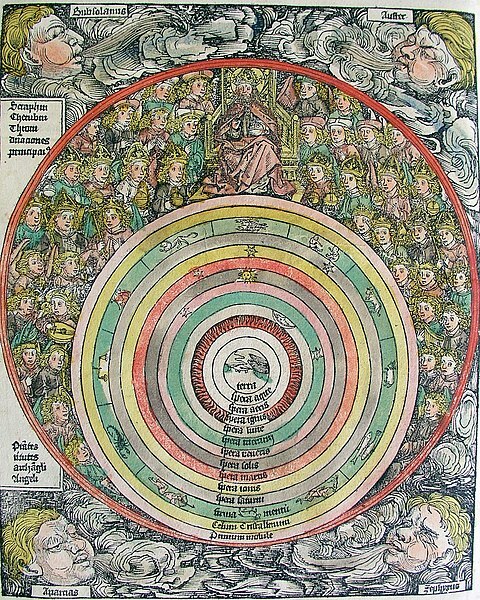 This description is illustrated by drawings which show the heavenly spheres as concentric circles, through which men ascend, as if on Jacob’s ladder, to the highest sphere, the Empyrean, on which Christ sits enthroned. The heavenly circles are complemented in a downward direction — that is, towards the earth — by the elements. Next to the lunar sphere is the circle of fire; onder this is the circle of air, which encloses water, which immediately surrounds the earth. It is noteworthy that this anonymous manuscript, the Hermetic character of which is evident, recognizes the validity of all three monotheistic religions, Judaism, Christianity, and Islam. This clearly demonstrates how the Hermetic science, thanks to its purely cosmological symbolic language based on nature, can be combined with every genuine religion without conflict with the respective dogmas. 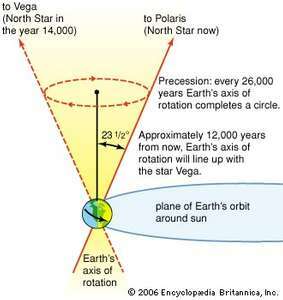 As the revolution of the eighth heaven, the firmament of fixed stars, is the basic measure of time, so the outermost starless heaven (which imparts to the eighth its slightly behind-hand movement, delayed by the so-called procession of the equinoxes) must represent the border-line between time and eternity or between all the more or less conditioned modes of duration and the eternal `now’. (1) According to Averroes the unbroken movement of the starless heaven is the mediator between time and eternity. The soul, which is represented as ascending through the spheres, will thus, once it reaches the Empyrean, leave behind the world of multiplicity and of mutually exclusive forms and conditions, and reach undivided, but all-embracing, Being. Dante represents this crossing — which involves a complete reversal of viewpoint — by confronting the cosmic order of concentric spheres which widen successively from earthly limitation to Divine Infinity, with a reversed order, whose centre is God, around Whom the choirs of angels revolve, in ever widening circles. They revolve fastest where they are nearest the Divine origin — in contradistinction from the cosmic spheres, whose apparent movement grows in proportion to their distance from the earthly centre. 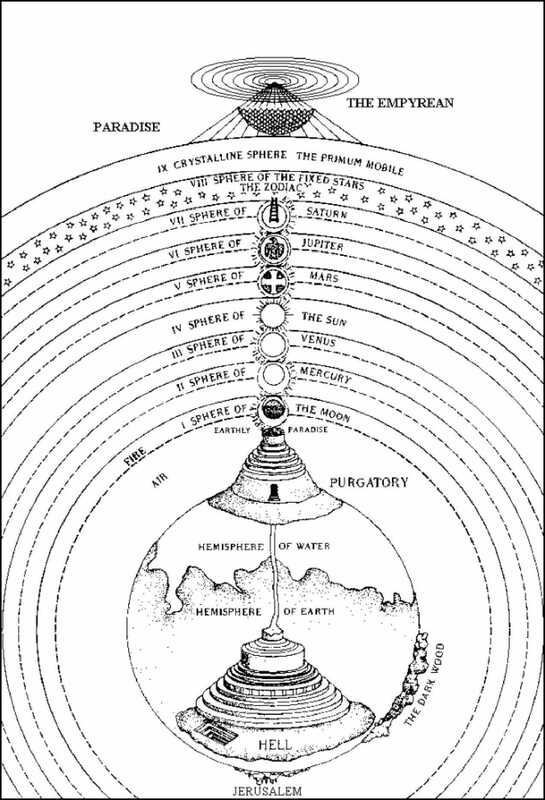 — With this ‘up-turning’ of the cosmic order into the Divine order Dante anticipated the deeper meaning of the heliocentric world-view. Plate THE ASCENT OF THE SOUL THROUGH THE SPHERES. 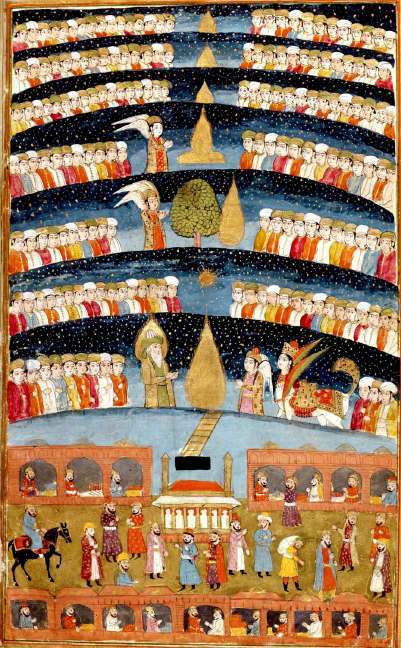 The Folio shows at the top the enthroned Christ above the spheres. Alongside are the words: `Creator omnium Deus — Causa prima —Voluntas divina — Voluntas divina‘ (The Creator of all things, God the first Cause — the Divine Will — the Divine Will). 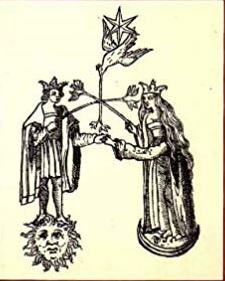 The two uppermost cirdes contain the words ‘forma in potentia’ and ,materia in potentia’. These are the two poles forma and materia prima, Pure Act and Passive Receptacle, which are here conceived as possibilities contained in Pure Being, and not yet manifested. This is why they lie outside the Universal Spirit, when this is viewed in its manifested or created reality, which is represented by the next circle : ‘Causatum primum esse creatum primum principium omnium creaturarum continens in se creaturas‘ (first effect, first created being, principle of all creatures, containing all creatures within itself). As stages within the Universal Spirit there follow ten intellectual or cognitive faculties (`intelligentiae’), to which correspond a similar number of angelic choirs. Curiously the order in which the, appear is the exact opposite to that of the Dionysian doctrine of the Heavenly Hierarchy ; from above downwards they are: `Angeli’, Archangeli’, `Troni’, dominationes’ , virtutes’ `principatus’, ‘potestates’, `Cherubim’ `Seraphim’ and cordo senorum’ (choir of elders). This reversal of order may be due to the error of a copyist who had a theocentric scheme in mind. Beneath these ten spheres of the supra-formal Spirit lie four spheres of the soul: ‘Anima celestis’ , ‘Anima rationabilis’, Anima animalis’ and Anima vegetabilis’. So far the concentric order of the spheres is intended purely symbolically, whereas the succeeding (and ever smaller) spheres of the corporeal world are to be understood both symbolically and spatially : the corporeal world is surrounded by its outermost circle : `Natura principium corporis‘ (Nature as principle of bodies). It contains the astronomic spheres, the outermost of which correspbnds to the daily revolution of the heavens: `Spera decima spera suprema qua fit motus de occidente ad orientern et est principium motus’ (tenth sphere — highest sphere, in which takes place the movement from West to East, and which is the principle of all movement). 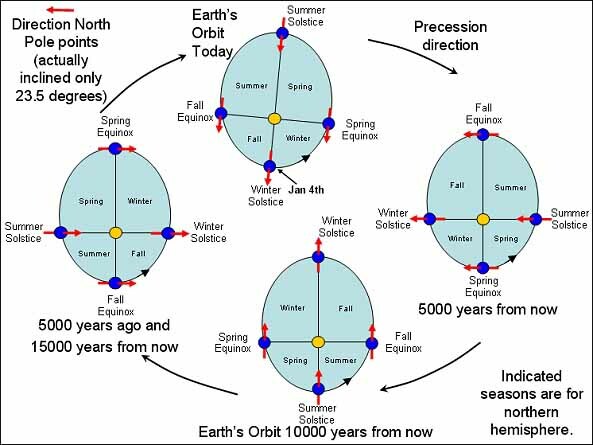 Inside this is the sphere which determines the pre-cession of the equinoxes : Spera nona — spera motus octave spera qua fit motus dus de septentrione ad meridiem et e converso’ (ninth sphere, which moves the eighth sphere and causes it to travel from North to South and vice versa). Inside these lie the four elements in concentric circles around the centre of the earth (the outermost circle corresponds both to the domain of the elements as such, and to the highest element fire): ‘Ignis — corpus corruptibilis quod est quatuor elementa’ (Fire — corruptible body consisting of the four elements) ; ‘aer’ ; ‘acqua’ ; `terra’; `centrum mundi‘. Through these circles of the spiritual, psychic and corporeal worlds men rise to God as if on a ladder. The lowest figure is still bound to the domain of the elements and a companion is dragging him up from this by the hair. Alongside the upperrnost groep is written: `0 mi magistrerr’(0 my Master? ), alongside the next:(e) phebei’ (youths‘), alongside the middle group : ‘socii omnes‘ (all companions), and alongside the lowest: ‘cetera turba‘ (the remaining crowd). This is presumably a reference to different degrees of wisdom or initiation. 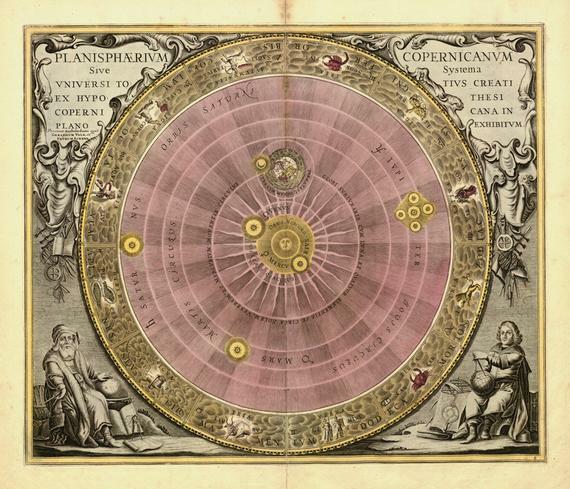 As a symbol, the heliocentric world-view is the necessary complement of the geocentric. For the divine origin of the world — that is to say the one Intellect or Spirit through whom God produces the world — can just as easily be thought of as the All-Embracing (corresponding to limitless space), as it can be thought of as the one `radiating’ Centre of all manifestation. Precisely because the Divine Origin is so high above all differentiation, each representation of it has to be complemented by its own inverted counterpart, as if seen in a mirror. 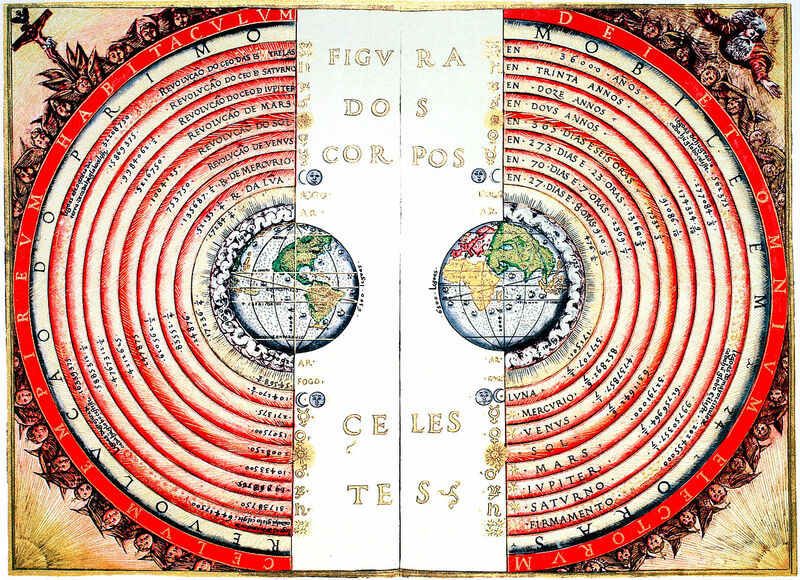 The heliocentric world-view, however, was in fact used by rationalism to prove that the traditional geocentric world-view — and all the spiritual interpretations connected with it — were pure deception. And from this arose the paradox that a philosophy which made of human reason the measure of all reality, resulted in an astronomical world-view in which man was to appear more and more like a speek of dust amongst other specks of dust, a mere accident without any sort of cosmic precedence, while the medieval perspective, based not on human reason but on revelation and inspiration, had placed man at the centre of the cosmos. God also created the elements of the cosmos. All the elements are present in human beings and each human being is able to function through the elements, which are fire, air, water and earth. 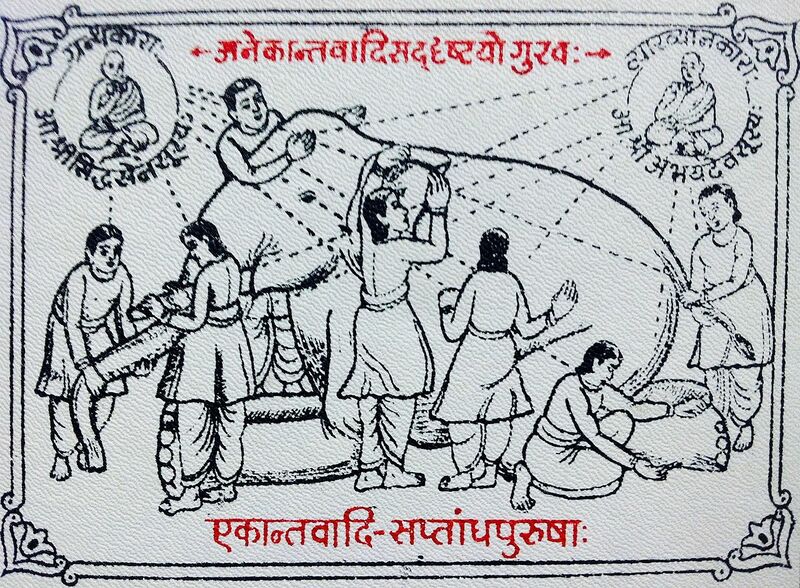 These four basic substances are interwoven and connected to such an extent that none of them can be separated from the others; and they are so closely interconnected that they are known as the firmament. This blatant contradiction is nevertheless simple to explain. The rationalistic view forgets completely that everything which it may express concerning the universe, remains a content of human consciousness, and that man, precisely because he can look at his physical existence from a higher point of view — as if he were not, in fact, bound to this earth — clearly demonstrates that he is the cognitive centre of the world. Precisely because man is the privileged bearer of the Intellect, and therefore may know essentially all that is, the traditional perspective places him at the centre of the visible world, which position, in fact, entirely corresponds with immediate sensory experience. 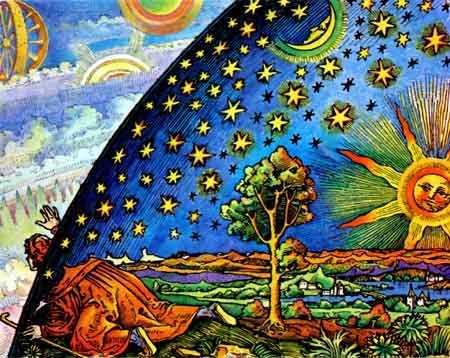 In the same view, namely that of traditional cosmology, the heliocentric world-picture, in which man is, so to say, peripheral to the sun, can only have an esoteric meaning, namely that which Dante has in mind in his `theocentric’ description of the angelic world: from the point of view of God man is not in the centre, but on the outermost border of existence. That the heliocentric viewpoint should seem more correct from the physical-mathematical point of view is an indication that this point of view itself has something not quite human about it . It refuses to consider man as a whole, as a being composed of spirit (intellect), soul, and body, in favour of an exclusive consideration of the material-quantitative plane, and so becomes the ‘inferior’ reflection of the viewpoint which sees man sub specie aeternitatis. No world-picture can ever be absolutely right, for the reality which our observation takes cognizance of is conditioned, dependent, and endlessly multiple. Belief in the heliocentric system as something absolute has created a tremendous vacuum: man has been robbed of his cosmic dignity, and having been made a meaning-less speek of dust amongst all other specks of dust circling round the sun, has shown himself incapable of achieving a spiritually satisfying vision of things. Christian thought, eentred on the incarnation of Christ, was ill prepared for this. To be able to see man as a disappearing nothingness in cosmic space, and at the same time as the cognitive and symbolical centre of the latter, quite exceeds the capacity of the majority. Latterly, with the consignment of the sun itself into the stream of countless millions of other suns (perhaps also surrounded by planets) with perhaps thousands and millions of light years between them, no world-picture, in any true sense of the term, is any longer possible. The ‘construction’ of the world is no longer imaginable, with the result that man loses his capacity to integrate himself into a meaningful whole. Such at least is the usual effect of the modern viewpoint on Westerners. The Buddhist way of seeing things, which has always regarded the world as shifting sand, may show a different response to the scientific thesis. If scientific knowledge went hand in hand with a spiritual evaluation of appearances, one would be able to see, in the successive abandonment of all so to say closed systems, a proof that every vision of the world is no more than an image or reflection and as such is in no wise unconditional. For this world, the sun, which our unaided senses experience, is the sum total of light and the natural symbol of that divine origin which illumines all things and around which all things revolve. At the same time, however, it is merely a luminous body, and as such not unique, but one thing amongst others of the same kind. This is not the place to show how each new world-picture is demanded, not so much by new scientific observations, as by the logical `unilateralness’ of the preceding one. This applies also to the latent conceptions of space. 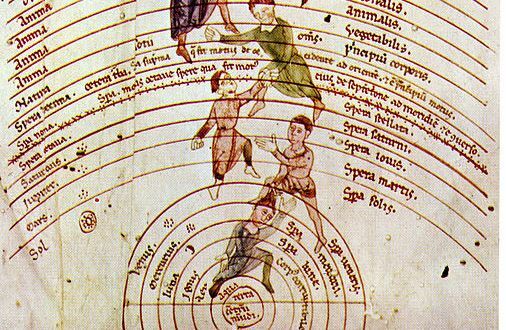 Medieval cosmology imagined the totality of space as an immeasurably great sphere spiritually encompassed by the outermost heavens. Rationalistic philosophy considered space to be infinite. Since, however, as conditioned extension, it may well be indefinite but is certainly not infinite, the next scientific step leads to a virtually unimaginable concept of a `curved’ space flowing back into itself! The unconditional homogeneity of space and time is abandoned by the latest mathematics in favour of a constant relationship between space and time. If, however, space is that which contains all that is simultaneously observed, and time is that which constitutes the succession of observations, then automatically the fixed stars are no longer separated from us by so many light years, but are situated where visible and simultaneously existing space has its outermost limit. In the face of this paradox, let it merely be said that ultimately every `scientific’ world-picture is doomed to contradict itself, whereas the spiritual meaning which manifests itself in one way or another in all visible things and which reveals itself all the more convincingly, the more primordial and the more suited to man the world-picture is, undergoes no change of any kind. If we speak here of a meaning, we do not mean anything conceptual. We use the expression `meaning’, of necessity and after the example of traditional writings, to designate the immutable content of things, which only the intellect is capable of grasping. By means of the preceding observations on the astro-nomical world-picture, we have perhaps succeeded in showing that there are two mutually opposed ways of looking at the world, or nature in the widest sense of this word. The one, impelled by scientific curiosity, strives towards the inexhaustible multiplicity of appearances, and, to the extent that it accumulates experiences, becomes itself multiple and dismembered. The other strives after the spiritual centre, which is at once the centre of men and of things, while supporting itself on the symbolical charac-ter of appearances, in order to presage and contemplate the realities immutably contained in the Divine Intellect. The latter point of view leads to simplification, not with regard to what it perceives as a multiple gradation, but with regard to what it deerns to be essential. `. . . The mirror was so made that no man could see him-self materially in it, for as soon as he turned away from it, he forgot his own image. The mirror represents the Divine Intellect. When the soul looks at itself in this, it discovers the shame that is in itself, and casts this away . . Thus purified, it imitates the Holy Spirit, and takes Him as a model; it becomes Spirit itself; it achieves peace, and always returns to this higher state in which one knows (God) and is known by Him. Then, having become with-out a shadow, it is liberated from its own chains and from those which it shares with the body . . . What is the adage of the philosophers? — Know thyself!